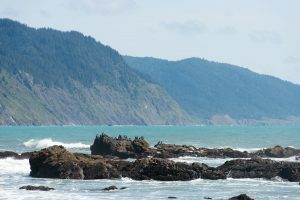 Sugarloaf Island from Mattole Road, near Cape Mendocino on California’s Lost Coast (Photo: Hamish Reid). 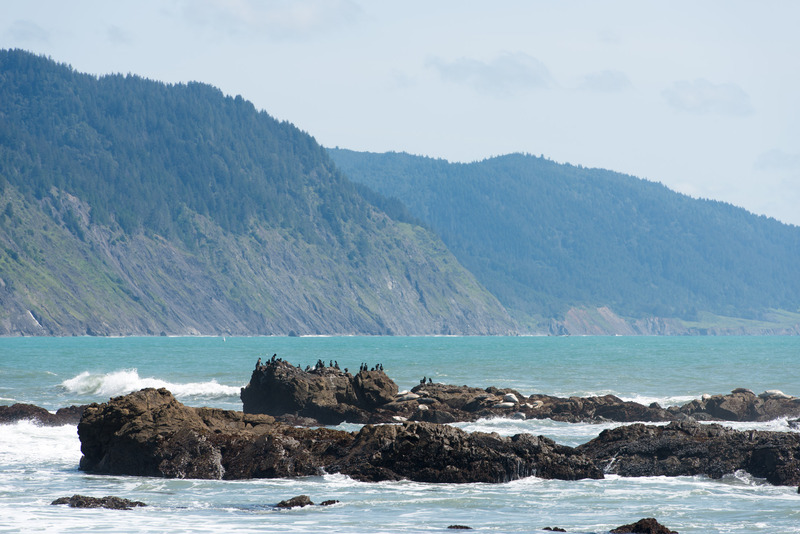 California’s Lost Coast is the last large and relatively-untouched bit of coastal California. To quote the Wikipedia page on the region, “the steepness and related geotechnical challenges of the coastal mountains made this stretch of coastline too costly for state highway or county road builders to establish routes through the area, leaving it the most undeveloped and remote portion of the California coast”. If you want to get a flavor of the place, take a look at the photo above — that’s the main road through the area. You can’t even drive along the actual coastline for large stretches of the Lost Coast — on these stretches, there aren’t any coast roads at all, and the only access to the (very rough) Pacific Ocean is by long hikes through thick scrub or along the foot of tall cliff faces, where the hikes have to be timed to avoid you being cut off or stranded on some remote rock face for hours by a rising tide. So why recommend a driving trip there? Because, despite all you’ve just read, it’s actually pretty car-friendly, it’s very rugged and scenic, and as long as you remember a few basic things (like filling up with gas before you start, and being careful about the wildlife), and your car is not too decrepit, and you exercise a bit of patience, it’s a very rewarding place. And few Californians have actually been there, so you get extra brownie points for that, too :-). 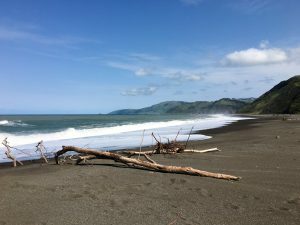 Warning: the Lost Coast, especially around Cape Mendocino and Petrolia, is seismically active (it sits on the collision of three plates — look up “Mendocino Triple Junction” some time), so be prepared, and take note of the tsunami warning signs and evacuation routes posted along the coast — you may actually need them. Warning: there’s a lot of wildlife lurking in the forests and bushes and just offshore. Most of it’s harmless, but there are bears, snakes, and mountain lions all within easy ambush or slithering distance of roads and hiking trails, so be careful. I’ve seen both bears (in the distance) and snakes (right on the trail) even on short hikes in the region. Simplifying a bit, the Lost Coast is basically that part of California’s Pacific Coast extending south from about Ferndale, California, to somewhere south of Shelter Cove, and stretching inland somewhere towards Highway 101. More expansively, you can think of it as roughly starting in the south where Highway 1 veers away from the coast and joins 101 at Leggett, and ending where the Eel River flows into the Pacific, south of Eureka — and extending east to about Highway 101. Note that lack of major roads west of US 101 in the map above; that’s kind of the point of the Lost Coast…. Nowhere on or near the Lost Coast is a quick drive from San Francisco, Los Angeles, or Sacramento — getting to the Lost Coast almost always involves a long drive on US Highway 101 from wherever you are, so this is not a day trip (and US101 isn’t even a freeway for a lot of its length north of about Cloverdale, and the traffic and constant roadwork can get annoying). You can actually get scheduled regional airline service to and from Arcata, but it’s not cheap. 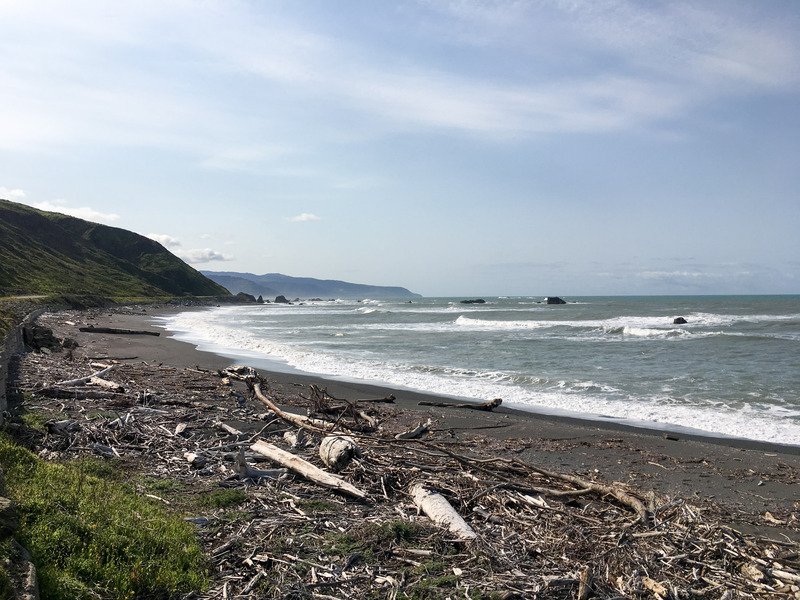 The nearest towns of any size with accommodation and supplies and cafes, etc., are basically Eureka, Arcata, Garberville, Ferndale, and Fortuna, none of which are actually on The Lost Coast itself. Shelter Cove is the only place actually on the Lost Coast that has hotel accommodation and stores of any size. There are plenty of places to camp on the Coast, but it’s pretty rugged, and you may have a long hike to get to the campgrounds. I don’t have any specific recommendations for camping at the moment, but I’ll report back after my next hike…. If you’re doing the lost coast, budget a full day for even the shorter drive (the Mattole Road drive below), unless you just want to drive on by without stopping. But why do that?! That said, it’s quite practical to do all three drives (or some obvious variant of all three) in one day if you want to, as long as you don’t linger too long in any one place (I’ve done it, but I spent the time wondering why I was doing it). 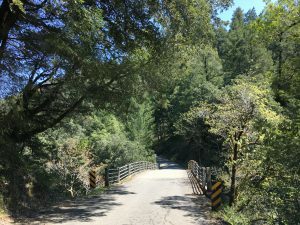 You should stock up on gas and snacks before any of these trips — you probably don’t want to be stuck on Mattole Road or Wilder Ridge Road without gas, as it’s a long way to the nearest gas station, and there’s no mobile phone / cell phone reception anywhere outside the largest towns around here. Note: if you’re going to use a phone-based GPS or Google Maps or whatever for these drives (which can be a good idea given the number of intersections and forks in the road without usable signs), remember that the phone won’t have service pretty much the entire time you’re on these drives. So Google Maps won’t work unless you pre-download the route before you start, and you need to check whether other GPS-based apps you might use have pre-downloadable maps or not. And take a look to see whether they have any useful road details for the Lost Coast — if your app doesn’t even show Mattole Road, or Mattole Road is the only road it knows about in the area, find another app! Mattole Road, near Cape Mendocino, California. This drive, which can take maybe three hours if you don’t stop, is marked on Google maps here: the Mattole Road drive. Mattole Road is the main road through the Lost Coast. By “main road” I really mean the only road. It’s not exactly a dirt track — it’s mostly paved — and it’s not really the only road (there are some smaller roads in the region, one of which is Wilder Ridge Road — see below), but it’s not any sort of major highway, either. 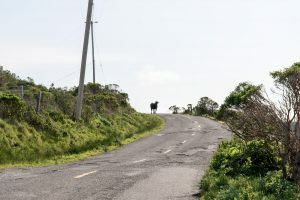 It’s potholed and rutted in places, it’s got soft or non-existent shoulders for most of its length, it’s hilly and full of stretches that seem to wind this way and that for ever, it’s prone to fog in places, and stray cattle loom up in front of you unexpectedly here and there. But having said all that, Mattole Road is fine for any reasonably-normal car in good condition — you definitely don’t need a four-wheel-drive or high clearance vehicle for this (the first time I did it, it was in an old Honda Accord). But drive carefully and slowly anyway. Steamboat Rock, near Cape Mendocino. My preference is to start at the northern end in Ferndale (after having stayed overnight in Eureka, Fortuna, or Arcata), but starting at the eastern / southern end is fine as well. I’ll assume we’re starting in Ferndale in what follows. First get to Ferndale from wherever you are by taking State Route 211 from US 101 (exit 692, Fernbridge Road). Ferndale itself is worth a visit on its own, or at least a good look around: it’s quite famous for the Victorian architecture of some of its buildings, and it’s a nicely located rather pleasant little town, but I’ll leave it to the other tourist guides, because we’re off to Petrolia on Mattole Road. To get to Mattole Road in Ferndale, take SR 211 as far as you can, then turn right onto Ocean Avenue, then take an immediate left on Wildcat Avenue / Mattole Road (you sort of can’t miss the huge “Petrolia” sign here, but people do). Drive on up the hill; you’re now on Mattole Road. Near Devil’s Gate, Mattole Road, on California’s Lost Coast. Keep driving up the road across the range for a bunch of miles; you’ll see some great views north towards Eureka and Humboldt Bay from the road as you drive this part of the road (hint: stop! Take a look! It’s easy to pull over along this stretch of the road). Once you get to the top of the range, you start descending towards the Pacific and the tiny settlement of Capetown. 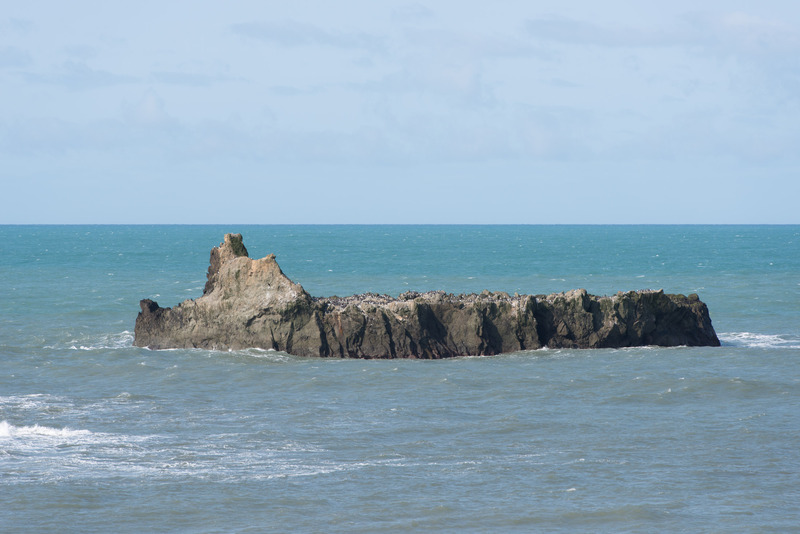 This is the Cape Mendocino area — Cape Mendocino is as far west as you can get in California, and it was the site of the Cape Mendocino Light (which, confusingly, you can now see at Shelter Cove if you take the Shelter Cove trip mentioned below). 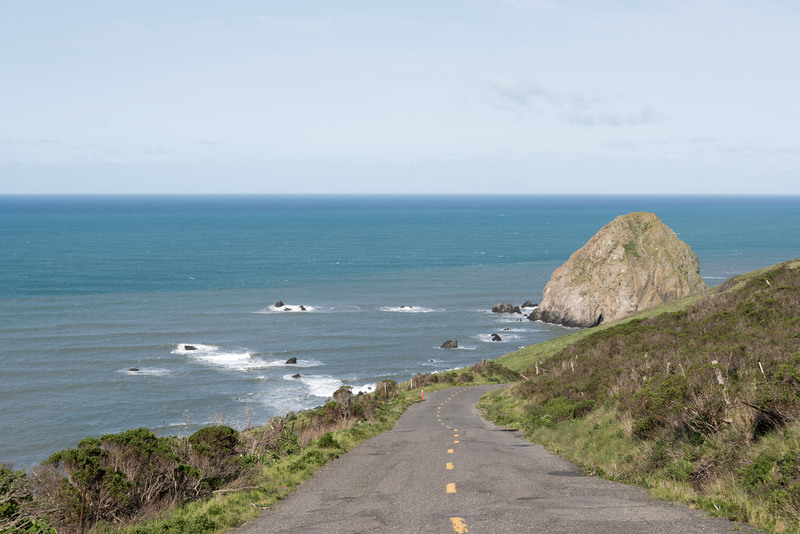 As you drive down Mattole Road towards the Pacific (assuming there’s no fog…) you’ll see Sugarloaf Island, Steamboat Rock, and the beaches that stretch south past Devil’s Gate and beyond. There are plenty of places to stop and park and stroll or hike the beaches along the next ten miles or so as the road goes along the coast right next to the ocean, and you should do just that, of course. But bear in mind that most of the land around here is private, so take notice of any “No Trespassing” signs and tread lightly wherever you are. The weather and ocean here can both be quite rough, so be careful, but the beaches are ruggedly beautiful, and worth the effort. 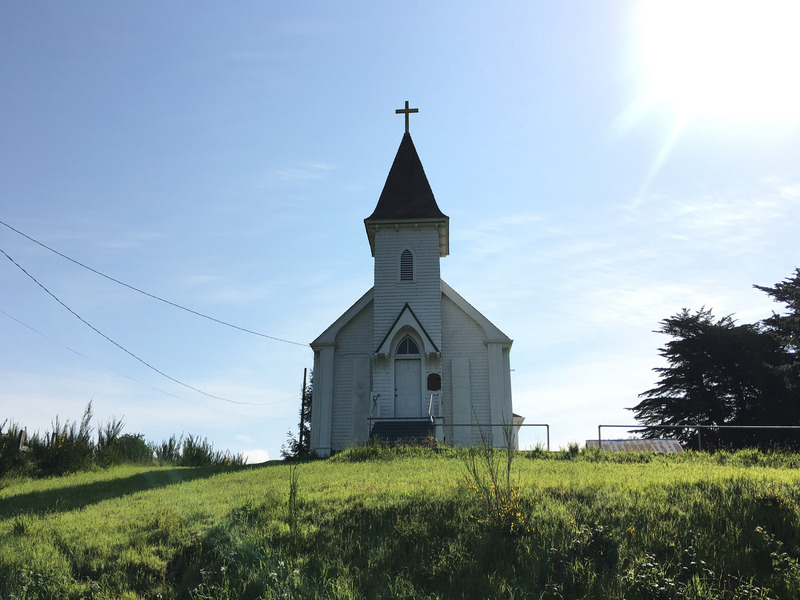 Church, Petrolia, California’s Lost Coast. Once you drive further south past Devil’s Gate and beyond, the road starts heading inland towards Petrolia along the Mattole Valley. Petrolia’s the town on Mattole Road — it’s not exactly big (more a village than a town), but you can get basic supplies there, including, if I remember correctly, gas at a tiny rural one-pump store. Petrolia was the first place in California where oil was drilled and produced commercially (hence the name); there’s a memorial plaque to that somewhere nearby. The town itself is worth looking around, but don’t expect to sit in a hipster cafe drinking obscure Second World coffees along with your hipster food — it’s really just the focal point for a lot of the people who live in the surrounding valley and hills, and there are a lot of mountain folk and hippies in the hills around it. Mattole Beach, on California’s Lost Coast. Once through Petrolia, keep going along Mattole Road until you cross the Mattole River, then turn right on Lighthouse Road just across the bridge. This road — which may not always be suitable for every car, given its unpaved and sometimes flooded or badly potholed condition — will take you to the Mattole Beach trailhead and parking area, and to within hiking distance of the Punta Gorda Lighthouse, another legendary California lighthouse. It’s a six to eight mile round-trip hike to the lighthouse along the beaches and cliff faces (see e.g. the California Beaches Punta Gorda Lighthouse page), so only do this hike if you’ve got enough time for that, and you have a tide chart. Parts of this trail are blocked at high tide, which can be inconvenient (at best) if you mistime things. 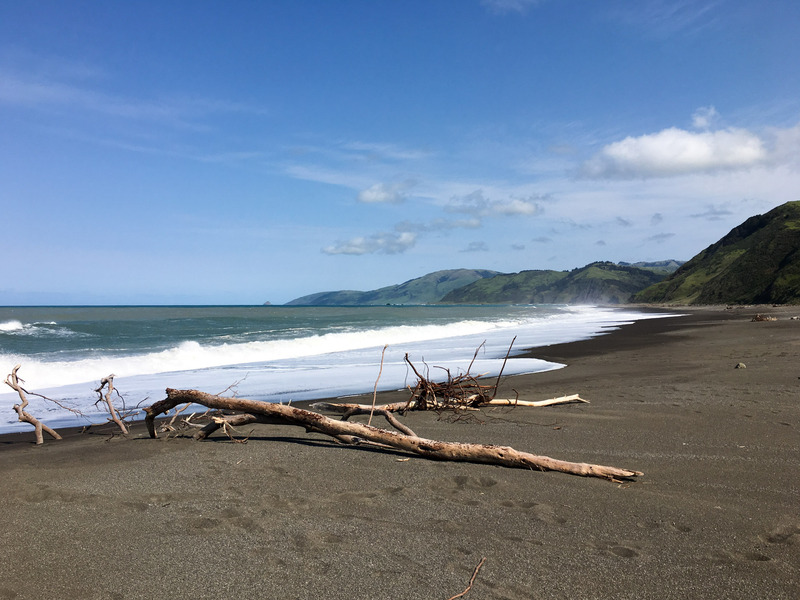 If you’re not hiking to Punta Gorda, just park at the trailhead and enjoy strolling along Mattole Beach, and marvel at the serious hikers starting out on a three day hike south along the coast to Shelter Cover or wherever. 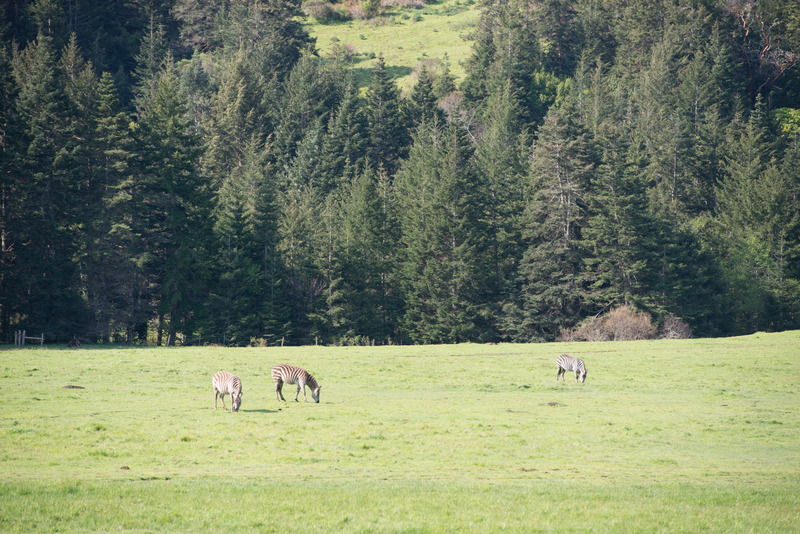 Some zebras hanging around near Mattole Road, California (as they do). When you’re finished with Mattole Beach, drive back up Lighthouse Road and back on to Mattole Road, heading towards Honeydew. This section of the road is mostly inland, and occasionally follows the Mattole River through the Mattole Valley, and it’s a leisurely sort of drive next to farmlands and forest. You’ll get to Honeydew fairly quickly, unless of course you stop for photos or a stroll. Honeydew’s another tiny settlement with the absolute basics (but no gas, if I remember correctly). At Honeydew you can either keep going along Mattole Road, or you can take Wilder Ridge Road towards Shelter Cove (see “Wilder Ridge Road / Shelter Cove” below). 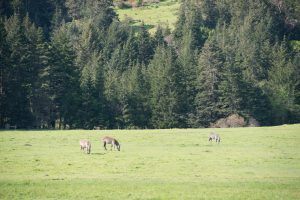 Assuming you’re staying on Mattole Road, you’re now headed for a hilly and very curvy section of the road as it heads through the hills and forest over to Humboldt Redwoods State Park. This is beautiful country, and as always, there are plenty of places to pull over and take a look (but there’s not much hiking near the road itself, though, until you’re in the park). Once in the park, you know what to do — admire and enjoy the redwoods and the forest, stroll around, drive along the road through the hills and mountains, etc. As Wikipedia notes, “Over 100 of the 137 known trees over 350 feet (110 m) tall—all coast redwoods—occur in Humboldt Redwoods State Park. It is home to the 4th-tallest measured living redwood, the Stratosphere Giant, which was measured at 112.94 metres (370.5 ft) in 2004.”. But, really, what’s most attractive for me in this part of the world is just the accumulative effect of so many tall trees and the associated temperate rain(y) forest all together like this. And in this part of park, you won’t see too many other people or cars (unlike The Avenue Of The Giants discussed below). Keep going along Mattole Road until it essentially ends at Lower Bull Creek Flats Road; this is very close to the Rockefeller Loop, a nice short graded and marked trail through the Rockefeller Forest, right near the road. And that’s essentially it for Mattole Road — less than a mile further up Lower Bull Creek Flats Road, you can get back on US 101 and return to Eureka or San Francisco or wherever. Unless you also want to do The Avenue Of The Giants (below)…. Instead of taking Mattole Road from Honeydew through the Humboldt Redwoods State Park back to US 101 (as above), you can do a longer, more coastal route back to 101 (and optionally through The Avenue Of The Giants, below). This involves visiting Shelter Cove, the only “proper” town on the Lost Coast coast itself (it even has a small airport in the center of town which I’ve flown in to several times, but it doesn’t have scheduled airline service). Shelter Cove has a dramatic setting — tall cliffs falling in to the rough Pacific, for example — a bunch of black-sand beaches and rocky shorelines, lots of wildlife (whales and seals, just to mention a few, and ignoring the snakes), the transported old Mendocino Light (see above), and a bunch of walks and hikes along the coast that vary from a few hundred yards to a full three days slog. Shelter Cove’s easily worth the extra driving, if you ask me, but the road there isn’t always quite as good as Mattole Road, and it’s quite a long drive. Budget perhaps half a day for this drive, maybe more, depending on how much you stop and what you want to do (that time includes stopping in Shelter Cove and getting back from Shelter Cove to US 101). Note that there used to be two routes marked here — a shorter route along Kings Peak Road, and the Ettersburg route in blue. The Kings Peak Road route is more scenic, but it’s rougher than the longer one, it was barely passable in a Subaru the last time I looked at it, and I don’t recommend it at the moment. The longer Ettersburg route is also very scenic, of course, so you don’t lose much (especially not time) by taking it, and, with a few exceptions, it’s an easy drive along a fairly well-maintained dirt road with paved sections here and there. And don’t forget that you have to get back to US 101 from Shelter Cove as well, which adds maybe another scenic hour to the trip. Start this drive in Honeydew by turning right onto Wilder Ridge Road from Mattole Road. Wilder Ridge Road is mostly a dirt road, but it’s in fair condition, and won’t be a problem for well-maintained cars. It’s also pretty curvy in places, with switchbacks here and there, so you can’t take it quickly. But why would you want to? It’s relentlessly scenic, with forests and cleared areas, rivers and creeks, rickety one-lane bridges, and lots of places to stop and take a look around you. Bridge across the Mattole River, Ettersburg Road. After several miles the road forks with Kings Peak Road to the right, and Wilder Ridge Road to the left; stay on Wilder Ridge Road unless you want to take the more adventurous way. Several more miles down the road you take a left at another fork, onto Ettersburg Road; you then follow Ettersburg Road for another five or six miles through the same sort of landscapes as on Wilder Ridge Road until you get to Briceland Thorn Road (turn right here), which turns into Shelter Cove Road. 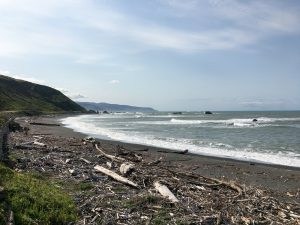 Which leads you to Shelter Cove itself, along a twisty (but properly-paved) two-lane blacktop road that has wonderful views of the Pacific and the Lost Coast as you descend into Shelter Cove. 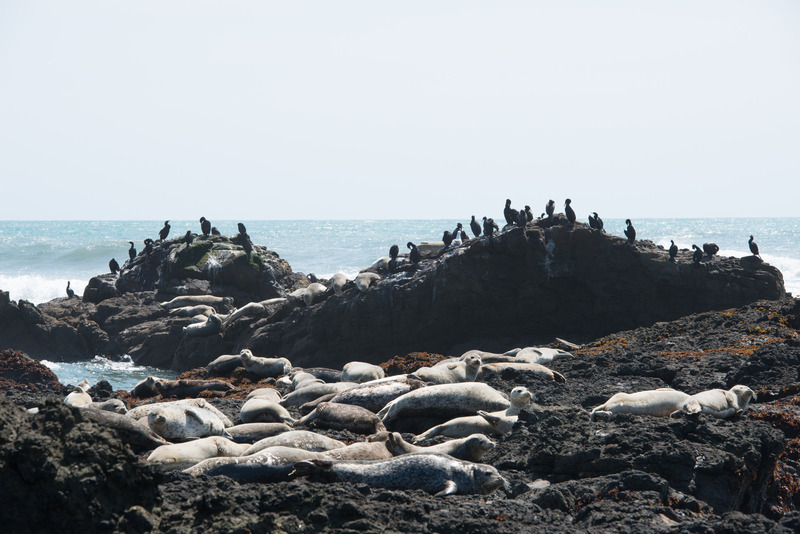 Some of the locals at Shelter Cove. Once in Shelter Cove I suggest you first stop at the Mendocino Light parking area, and stroll around the headlands and beach and the cove itself there for a while to get your bearings. You sort of can’t go too far wrong here whatever you do, and everything’s walkable in this part of town, including several stores and food places. After that, you could drive north a little way to the main black-sand beach, or hike a bit north or south, or just hang out locally and watch the small planes landing and taking off, or eat, or have a picnic, or watch the boats being launched (whatever!). And if you want to stay there overnight, you can camp, or stay at one of the several motels in town; I don’t have any recommendations for motels, but I have camped in the commercial campground right next to the airport and enjoyed the experience. After you’ve done Shelter Cove, you need to drive back up Shelter Cove Road and Briceland Thorn Road to US 101. This can be a slow drive, so budget enough time for the inevitable slow RV to block your way for many miles or for roadwork, and plan on visiting The Avenue Of The Giants when you get back towards 101…. Inside the redwood forest, off the Avenue Of The Giants, California. The Avenue Of The Giants (which runs alongside US 101 for maybe thirty+ miles from a little north of Garberville to maybe a dozen miles south of Fortuna) isn’t really on the Lost Coast, and it’s hardly lost, or unknown, or rarely-visited, but I think it’s worth visiting and driving along if you’re in the area. And since both of the two drives above end on The Avenue (or very close to it), you’ll definitely be in the area. I don’t have much to add to the Wikipedia page for the Avenue, or the Avenue of the Giants: The 31 Mile Redwood Drive You Have to Do page on California Through my Lens, except to say that if you only have a short time, or can only do one of the short hikes in the area, do the Drury Chaney Trail at the northern end of the Avenue (that’s just a suggestion). But as with much of the region, you really can’t go wrong wherever you go on this drive — get out and walk wherever you see a trailhead, or just enjoy the winding leisurely drive through the forest. 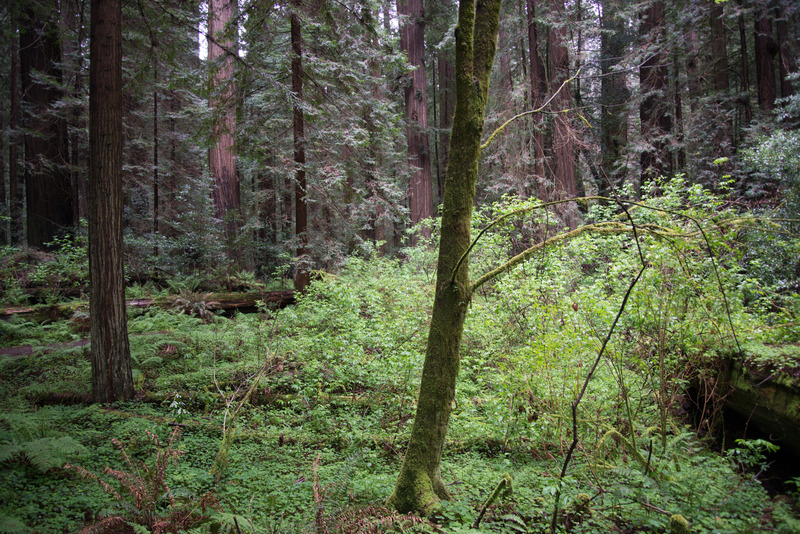 Note: I don’t think I’ve ever visited the Avenue Of The Giants when it wasn’t raining, so keep that in mind…. For more detailed information and advice on hiking the redwoods (and not just in Humboldt County), check out the excellent Redwood Hikes site.